The national midterm narrative so far has been about how voters repudiated President Obama and his policies. But this isn’t the Asian American narrative. 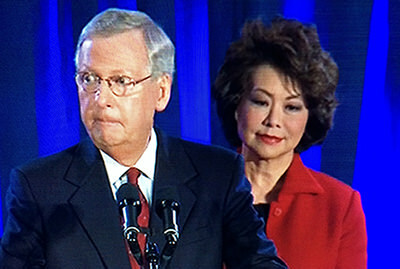 Neither is it Elaine Chao standing next to her husband, the presumptive new Senate Majority Leader Mitch McConnell. No, the Asian American narrative is one we know, but the one the white political mainstream is just coming to grips with. Asian Americans bucked the trend. The yellow vote was a lot more blue than red. For example, here’s one jarring finding in a three-state election eve poll targeting Asian Americans in multiple languages and ethnicities. Referendum on Obama? Asian Americans gave the president a 58 percent approval rating. You didn’t see this number in the mainstream media. The prevailing narrative is more comforting–that the midterms were a reprieve for the white voter. Then again, in midterm elections, the people who vote are typically more engaged in politics. They are the older white voters who may have had a soft spot for FDR and the New Deal. Today, these older voters are more likely to revere Reagan and Bush and vote conservatively. So if you want to explain why the electoral wash turned red, that’s the reason. Most of the others, the young, the less well off, people of color? They tend to take midterms off. Or are just turned off. It was interesting to see on the morning after how white pollsters still had to acknowledge the election was not a tsunami, but a warning sign of the bigger tsunami to come– the inevitable electoral demographic shift. Ah, he said the magic word. “Asians.” Almost like an afterthought. It won’t be for long, not with Asian Americans the fastest growing electorate, which increased 128 percent from 1996 to 2008. The invisible Asian American voter is about to be discovered. Because now, politicos finally have to reach out to Asian Americans if they ever want to elect another president. And what pollsters like Ayres will find is the Democratic stereotype is true. Even in a midterm election awash in red, Asian Americans voted blue in a big way. According to the election eve poll conducted by Asian American Decisions and the AAPI Civic Engagement Fund, Asian Americans favored Democratic candidates over Republicans, 66 percent to 34 percent, or nearly two-to-one. The AALDEF exit poll, conducted in 11 states, found that 59% of Asian Americans were registered Democrats, 15% were not enrolled in any political party, and 26% were registered Republicans. The key finding for me was in Virginia, where the Senate incumbent, Democrat Mark Warner, barely edged out Republican challenger Ed Gillespie by .5 percent of the vote. According to the election eve poll, Warner garnered 68 percent of the Asian American vote to 29 percent for Gillespie. These results mirrored the findings of the AALDEF exit poll, which found that the Asian American vote was 66 percent for Warner and 33% for Giillespie. In the Virginia race, the Asian American influence is undeniable. Warner could not have won without the Asian American vote. But you won’t find this kind of data unless groups like AALDEF and the newly-formed Asian American Decisions continue to conduct multilingual polls focusing on Asian American voters. Right now, mainstream pollsters get information from large random samples. They might get some Asian voters, but only those who speak English. And if pollsters don’t sample in populations where we live, the chances of getting enough Asians to matter is even smaller. AALDEF went to 63 poll sites in 11 states and the District of Columbia and polled in 12 languages: Chinese, Korean, Vietnamese, Tagalog, Khmer, Arabic, Bengali, Hindi, Punjabi, Urdu, Gujarati, and English. How do you say Gallup in Urdu? Pollsters need to purposefully oversample for Asians and do it in our languages. If they don’t, they’re going to miss out on the story that Asian American voters are saying loud and clear at the polls. So all’s well with Asian Americans for the Democratic Party? Not so fast. The election eve poll and the AALDEF poll both revealed that while Asian Americans like to vote Democratic, we don’t always like to identify as Democrats. There’s still that large group of Asian Americans who aren’t enrolled in any party. And one other thing the AALDEF exit polling and monitoring found: It’s not easy being an Asian American voter. In monitoring 146 poll sites in 11 states, AALDEF received over 340 complaints from Asian American voters, such as improper requests for voter ID, hostile poll workers, and lack of interpreters. And that’s just in the targeted districts with larger Asian American populations. One can only imagine the suppression of the Asian American vote in other places. As the election news came in, I kept thinking of Nancy Pelosi a week before the midterms. 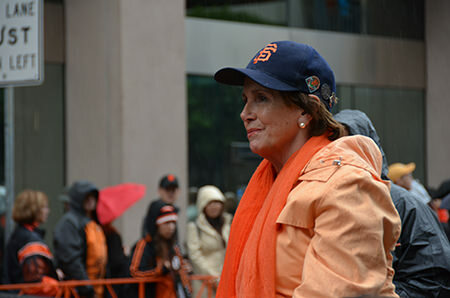 She was intermittently joyous for the Giants when it rained at their World Series Parade. But I knew she had to be thinking about the downpour to come. Pelosi’s not the House Speaker, and she lost allies in the Senate. But Pelosi won her district by a landslide, thanks to the Asian American vote. Pelosi’s known about the Asian American electoral narrative for some time. For the rest of you, don’t believe most of the mainstream exit polls–the ones that didn’t talk to Asian Americans and still dub us as “insufficient” in number. There are nearly two million registered Asian American voters in California alone, and over 4 million nationwide. That’s enough to do some real damage. As San Francisco’s Con gresswoman, Pelosi knows it. Asian Americans aren’t invisible. We’re just in stealth mode.